Palpitations (irregular or rapid heartbeat), that make many people anxious. Some people have mild symptoms of atrial fibrillation while some do not feel any prominent symptoms. Patient should visit general physician for atrial fibrillation treatment. 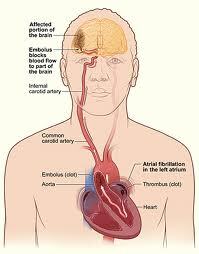 The symptoms described above can be caused by an ailment other than atrial fibrillation. People having rapid atrial fibrillation are at risk of heart attack and stroke without having any serious heart condition or ailment.